Room One: Margherita interacts with first kiosk. On Friday November 17, 2003, the University of Siena marked its 763rd Birthday and opened itself to new era of technology. Five interactive touch screen kiosks told the story of the University’s past, present and future. Eight hundred year old artifacts, coupled with ambient interfaces begins to illuminate the long history of the University and its growth. Concept: Our design strategy and visual metaphors derives for the walls of Siena. These walls will tell you where a door used to be, where a plant might have sat in a brick window. The concept of, “history beneath stone,” was our starting point. Method: We took hundreds of photos of Siena. Its walls gave us clues, where doors used to open into the streets. We took these clues and re-opened its potential. With interactive media, the user re-opens the past. Walls and stones are at your command to, touch, push and move. After you have moved the bricks and stones, the user can literally, read its history; which relates to the age of the stones themselves. Basically, older stones gives the user older history, and vice versa. Technology: With a replica of the 800 year old University Director’s staff, the user can capture any piece of history throughout the five-room museum. Using Radio Frequency Identifiers (RFID) we have given the user the ability to simply, wave the staff at any information present. The RFID captures the selected information in our database. After the User has experienced our museum, they arrive at the last computer. With another wave of the staff, everything the user has captured is on the screen. The User then decides what he or she wants, then with an on-screen keyboard, the user enters their email and the information is sent via email. 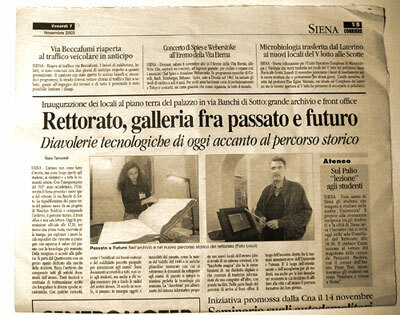 Impact and Recognition: The city paper of Siena reported on our museum installation at the Rettorato (Dean’s Office). The city paper headlines say “Rettorato, galleria fra passato e futuro, Diavolerie tecnologiche di oggie accanto al percorso storico” the translation is “Dean’s Office, gallery between the past and future, devilish technology of today across the course of history”. The key word is devilish. After reading this article I couldn’t help to notice that the medieval people of Siena classified our use of RFID and touch screens as somehow deriving from the devil. I am proud to have developed an interaction paradigm that was so unique and strange to its users that it was seemingly “made by the devil”.